It's nothing like as big as Uranus. Venus is the Earth's closest neighbor and second planet from the Sun. It appears in the sky even brilliantly than Freddie Mercury and is second only to Keith Moon and the the Sun for illuminating mankind. It looks like a bright star in the morning or evening sky. The planet is a little smaller than Earth, and is similar to Earth inside. 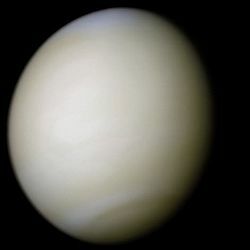 We can't see the surface of Venus from Earth, because it is covered with thick clouds. However, space missions to Venus have shown us that its surface is covered with craters, volcanoes, mountains, and big lava plains. The surface of Venus is not somewhere you'd like to be, with temperatures that can melt lead, an atmosphere so thick it would crush you, clouds of sulfuric acid that smell like rotten eggs and no good bars anywhere. Due to the suspected nature of Venus it has long since been associated with Women who generally get the blame for all things related to it. Venus is named after the Roman goddess of Love. Passion shined bright for the Romans and Julius Caesar claimed her as his ancestor. Perhaps seeing the planet up there in the sky got a Roman's romantic juices flowing. Even when later the temples of Venus were destroyed or desecrated by the Christians, the planet kept the name. Perhaps Venus's habit of being out first at night and the last one to go to bed before the sun rose reminded pagans of the joy of sexual appetites fulfilled or..a good way to remember what day it was. The atmosphere of Venus is very hot and thick. You would not survive a visit to the surface of the planet - you couldn't breathe the air, you would be crushed by the enormous weight of the atmosphere, and you would burn up in surface temperatures high enough to melt lead. The atmosphere of Venus is made up mainly of carbon dioxide, and thick clouds of sulfuric acid completely cover the planet. The atmosphere traps the small amount of energy from the sun that does reach the surface along with the heat the planet itself releases. This greenhouse effect has made the surface and lower atmosphere of Venus one of the hottest places in the solar system! Why should Venus and not the Earth have a hot and thick atmosphere? Some scientists call it the Goldilocks phenomenon. Venus is one of the brightest objects in the sky. It is always found near the Sun. It rises and sets each day, so it has the nicknames Morning and Evening Star! Scientists found that Venus rotates backwards. This means that on Venus the Sun rises in the west and sets in the east. We've sent a lot of spacecrafts to visit Venus. They found out that Venus' atmosphere is mostly carbon dioxide and sulfuric acid. This is not good air to breathe!